With a lot of traffic linked to Transportation with Eastern and Northern countries, we permanent routes with countries such as Poland, Czech Republic, Slovakia, Hungary, Croatia, Romania, Bulgaria, Greece, Lithuania, Latvia, Estonia , Sweden, Finland. Our traffic team, of different nationalities, masters almost all European languages which makes easier the resolution of any incident that may arise during the loading / unloading process or during the journey. The operator in charge of the freight keeps track of the entire transport process and remains always available to give any required information. Likewise, we have the support of our subsidiary in Hodonin (Czech Republic), for the freights to East and Central Europe. We mainly use 40 tons trailers. : tilts, tautliners, megatrailers and refrigerators. 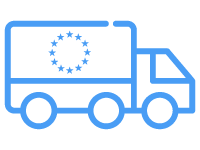 We transport complete loads (up to 25 tons approximately) door to door, with the option of several pick ups and deliveries on the way, even in different countries. Most of our trucks are equipped with 500 DAN and 2500 DAN straps, corners and non-slip mats, and the all the drivers are provided with safety outfit. If needed, we can organize trailers with two drivers for urgent deliveries, and even vans and mini-Tirs door to door for full loads of up to 1,200 kg: such trucks perform the transport faster as they are not obliged to have a tachograph and the driving time is not limited during the weekend. We also carry out A.D.R. transports (dangerous goods), large volume, special and specific coil-trailers. Do not hesitate to contact us in case you need a special operation. Our team will be pleased to offer you the best and more efficient solution.